As of July 2011, there are five major metropolitan areas in the Northeast experiencing unemployment rates above 11 percent, the Bureau of Labor Statistics recently reported. At the same time however, the Northeast also lays claim to a number of regions with very low unemployment rates that rank far below the national average of 9.1 percent. 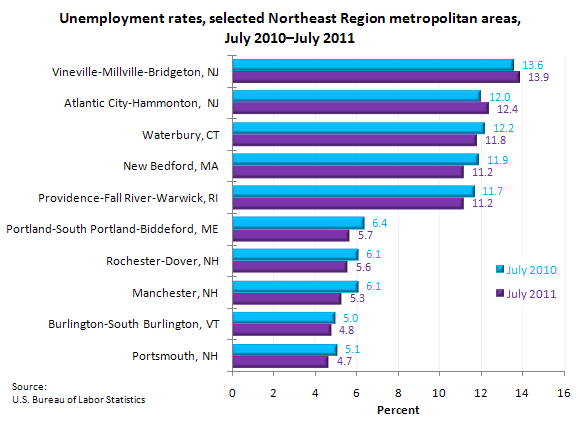 Out of the 50 northeast metropolitan areas, five Northeast regions saw unemployment rates below 6 percent. The Northeast Region consists of Connecticut, Maine, Massachusetts, New Hampshire, New Jersey, New York, Pennsylvania, Rhode Island, and Vermont. Combined, they have 50 metropolitan areas, each with its own unemployment rate. Vineland-Millville-Bridgeton, New Jersey, recorded the highest unemployment rate at a devastating 13.9 percent, with Atlantic City-Hammonton, New Jersey reporting a substantial 12.0 percent. Waterbury, Connecticut came in a close third at 12.2 percent, with New Bedford Massachusetts and Providence-Fall River-Warwick, Rhode Island closing out the top five highest unemployment rates at 11.9 percent and 11.7 percent respectively. On the other hand, various regions throughout the Northeast are enjoying very moderate unemployment rates. Portsmouth, New Hampshire is reporting the lowest rate at 4.7 percent, followed by Burlington-South Burlington, Vermont at 4.8 percent. Manchester, New Hampshire has an unemployment rate of 5.3 percent. Rochester-Dover, New Hampshire and Portland-South Portland-Biddeford wrap up the top 5 lowest unemployment rates with 5.6 and 5.7 percent respectively.